My Choice by Sorana N.: Last days of summer!!! I really love those sunglasses! We are having a sweltering heat wave here, so I'm enjoying the air conditioning. Hahah! Aww, summer in your part is alreadygoing, luckly we have summer till october .. I love your shorts and clutch a lot..
Are thise two cute bow tatoos .. So cute..
Imi place mult tricoul cu picatelele de culoare, ochelarii sunt bestiali! Bine zici, o sa tanjim dupa vara.. 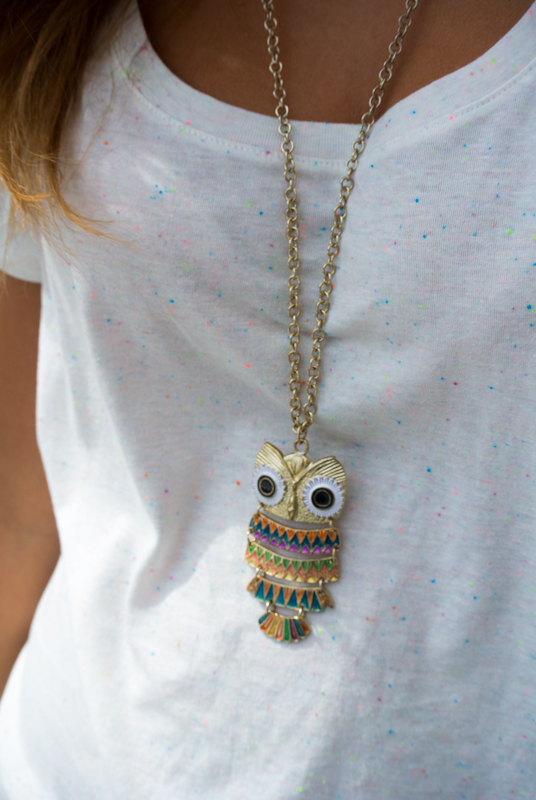 I love the pocket details of your shorts and your owl necklace - so cute! O cititoare noua. Imi place place blogul,tinutele sunt pe placul meu ,as putea sa ma inspir.Afor ochelarii de soare. You look perfect in these shorts! The two bow tattoos are ridiculously cute!! Thanks for visiting my blog my friend, I am following you on GFC <3 keep in touch! You are so stylish! I loved your shorts and your sunglasses! You styling options are so close to us! We will follow you on facebook hope you follow back! And the look was perfect all star! Yes, the last days of summer. 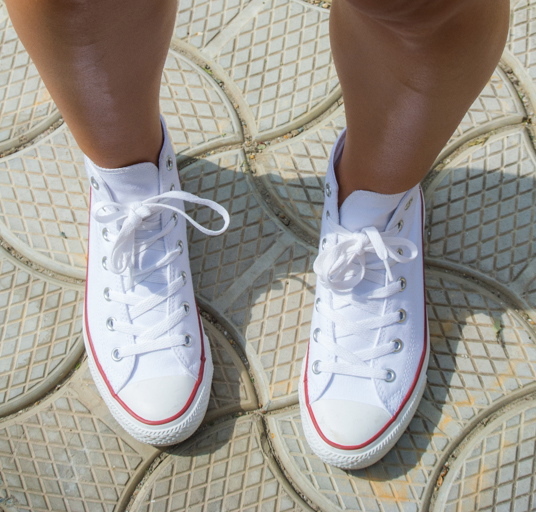 Time to make the most of wearing shorts, t-shirts and sandals. Very cute and simple outfit! Cata dreptate ai ... Nu imi vine sa cred ca vara a trecut atat de repede :(( chiar nu astept deloc zilele in care va trebui sa revin la blugi si bluziteee !!! you look beautiful sorana ! Love the bag and the necklace!! ochelarii colorati sunt clar un hit al sezonului! i'm in love with the sun glasses, they looks so good on you!!! And thanks you so much for your sweet comment on my video post!!! Thank you ;) You are so amazing ! aa and you have amazing tatoo ! Yes, another 3 months of summer would be nice. :) And those Bershka shorts would fit perfectly in my closet too, I think. :D And your hot pink nail polish too, I looking for that shade!! So sassy, CHIC!!! I loveeeeeeeeee your look and the little pretty cute bow tattoo. Such a fresh and summery look with that plain white tee and denim shorts! Like you, I'm trying to get as much use of my shorts and skirts as possible before it gets cold over here again (which will be very soon!). Also, you accessorized your outfit to perfection with that owl necklace and lovely green soft clutch! I love this outfit! The colors are perfect for summer days :) I'm also trying to enjoy the last warm days as well as I can, before the fall comes! please let me knwo, i would be very happy! I know! So sad summers nearly over but I love my outfits for winter! You look nice and I love your bracelets! Oh, the necklace! :) I love it.